The Samsung LC34F791 is a QHD ultra wide monitor with a 16:10 aspect ratio. This gives it a resolution of 3440 x 1440, ensuring you’ll get super sharp images above and beyond what a standard 1080p screen can muster. QHD is a great standard for this size monitor, with 2.5 times the pixel density of Full HD you’ll be treated to razor-sharp images whether in games or working with your favourite applications. This release adds 100hz support, ‘Quantum Dot’ back lighting and a deep curve that goes beyond what is on offer from the competition. Along with true 8-bit colour, without dithering, and 4ms quoted response time this screen looks very good on paper. As is obvious from the photos, this monitor has a strong 1500R curve which is steep for a monitor. I’ve not sat in front of this model yet so can only report that others who have used one say that the curve does add to the experience, giving additional depth. It might look off putting initially, but you soon get used to it. Samsung’s model numbers are somewhat baffling so you will see this listed in the UK as LC34F791WQUXEN, I understand the additional letters correspond to region codes. It’s a curved model which helps to bring the edges of the monitor into your line of sight and perhaps counter intuitively makes straight lines appear more natural to your eye. This CF791 model forms part of a series, also look out for the CFG70 which has 24″ and 27″ versions. There are various versions around so do check specs before clicking on the buy button. 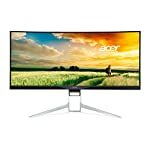 The Samsung C34F791WQUX is a large ultra wide monitor, you are probably familiar with wide screen, well this is a whole lot wider. These are big displays and you’ll need some decent desk space to accommodate it. On the plus side, the Samsung is elegantly made and the stand has a small footprint compared to other models in this sector. There is a limited height adjustment built into the screen and it is also VESA mountable. The screen itself has a very light matte anti-glare surface surrounded by very slim bezels which really do help give this monitor a premium feel, and you’d hope so at this price! If you are used to having two independent monitors then you can still simulate that by using two inputs, for example the included HDMI and DP sockets. As a modern monitor supporting high refresh rates, resolution and adaptive sync it includes the appropriate connectivity to provide bandwidth for these features. You’ll find 2 x HDMI 2.0 ports and DP 1.2a (both support Adaptive-Sync). USB 3.0 and headphone sockets are also catered for. This model features 2 x 7W speakers, I haven’t had a hands on so I haven’t heard what they are like but they reportedly provide a decent loud bassy sound. The LC34F791 has a height adjustable stand which isn’t always the case with these large ultra wide models. The dish shaped base is typical of Samsung’s range and I think it looks fairly stylish. If you prefer a different setup an included bracket provides 100 x 100 and 200 x 200 VESA mounting support. The 1500R curve is fairly steep, more so than most competitors. Whether or not a curve works for you is a matter of taste, users who require geometrically correct lines will want to take a cautious approach but most people find they quickly get used to it and the effect does help bring the edges into your view. The Samsung has a number of gaming credentials that make this look like a promising prospect on paper. The only question mark I have is over the VA panel which sits somewhere between TN and IPS but some don’t like how they handle motion. I haven’t had the chance to game on one of these, but the professional testers report that the Samsung VA panel offers a generous colour gamut and vibrant colours thanks largely to the Quantum Dot back light along with improved refresh rates. Colour consistency over the wider than normal length of the screen was also reported positively. Let’s look at what makes this model stand out. For a start it can run at 100hz which is a great start for gamers. You get big improvements quick as you go above the standard 60hz so although there are monitors that run faster, 100hz is still going to be a positive experience. Of course you’ll need a powerful card to produce 100 1440p frames per second. The professional testers report back a positive experience with the VA panel able to handle 100fps comfortably. FreeSync is also included, the anti-tear technology from AMD that ensures a smoother game experience assuming you have a compatible graphics card. This is a nice bonus that will help things along if your GPU can’t output 100 frames per second – which is quite likely on an ultra wide QHD screen! The FreeSync range for this screen is 48-100Hz so the functionality only kicks in within this window, drop below 48fps and you won’t feel the benefit. However this monitor includes AMD Low Frame Rate Compensation which set the monitors refresh rate at multiples of the actual framerate, for example if your game is running at 35fps the monitor will run at 70Hz to give smoother tear frame gaming below the FreeSync window. We give the Samsung LC34F791WQUXEN a 4 out of 5 rating. Want to know what existing owners of the monitor think? You can read real user reviews here. 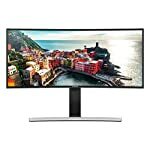 Should I buy the Samsung LC34F791WQUXEN? 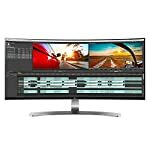 The Samsung C34F791 is a premium ultra wide screen which gives you a large area to work on whether gaming or, you know, actually doing work. The screen delivers a rich gaming experience enhanced by the 100hz refresh rate. Fortunately it also offers excellent out of the box image quality to justify the price. If you are having some doubts about this purchase then why not read some real owner reviews and see what other buyers think. Welcome to the Samsung LC34F791WQUXEN FAQ. This section attempts to answer common questions you may have, please get in touch if you have any more queries or if you think our answers need updating. Yes mounting is possible via an included bracket. The built in height adjustment forms part of the monitor itself so even when mounted it can still be raised and lowered in this way! Can I use this with my Nvidia graphics card? Yes! You can use it. But, this is a FreeSync supporting monitor so you won’t be able to make use of the adaptive sync tech. That may or may not be a problem for you, if you have a next gen beast of a Nvidia graphics card you should get good smooth images anyway. 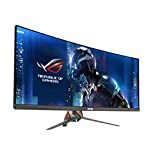 You have this ultra-wide monitor listed as being 16:10 when I believe it is 21:9. There are reports of flicker problems with Freesync on this model. 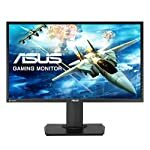 Please consider including the freesync range for monitors, it’s very useful. Thanks very much for the feedback, I have updated the error and added the FreeSync range – it was hard to track down, they don’t make it clear on their website. It seems to be that it can run at 80 – 100Hz in “standard engine” mode, but it can run with a window of 48 – 100Hz in “ultimate engine” mode. It also uses Low Framerate Compensation (LFC).